After becoming the WBO Asia Pacific champion yesterday by defeating Kerry Hope, Indian boxer Vijender Singh is looking at the possibility of a showdown with Pakistan-origin British star Amir Khan. Amir had previously signalled his intentions to take on Vijender in a fight in India. The win propelled the Indian to the 15th spot in the WBO rankings and he will have to defend the title in the next two months. Vijender dedicated his win to boxing great late Muhammad Ali and when asked about his next plans, the boxer said that he will rest for a month, before deciding the future. Thank you India! I didn’t expect it to go to ten rounds. It is all to my country, not about me. We have been working hard for this. Finally, we did it and we will work to improve my ranking now." “I’d like to dedicate this title to Muhammad Ali – he passed away recently. "I want to take some rest, maybe for a month or so and we will see after that. "My world ranking will be in the top 15. I will get harder fights now but I am ready for it. I will work with my coaches and my team and we will go for it,” Vijender said, reported PTI. The 30-year-old also hinted at the possibility of a showdown with British boxing star Amir Khan in the near future. "Mine and Amir's weight categories are different. So, in case he increases his weight or I decrease mine then we can work it out. We are thinking about it, so let's see. I hope that when that big fight happens, it happens in India only," said Vijender, thanking the fans several times during the presser for packing the 5,000-capacity Thyagaraj Stadium last night. Amir Khan, a former WBA World Champion, primarily a lightweight boxer had recently tried his luck in the middleweight category, only to see it backfiring emphatically against Canelo Alvarez. The British boxer had also expressed his intention to take on Vijender in a fight in India. Mine and Amir's weight categories are different. So, in case he increases his weight or I decrease mine then we can work it out. We are thinking about it, so let's see. I hope that when that big fight happens, it happens in India only,"
"In the long term, we will keep an eye on Amir Khan as well. That fight over here will be phenomenal, it will be a massive fight. 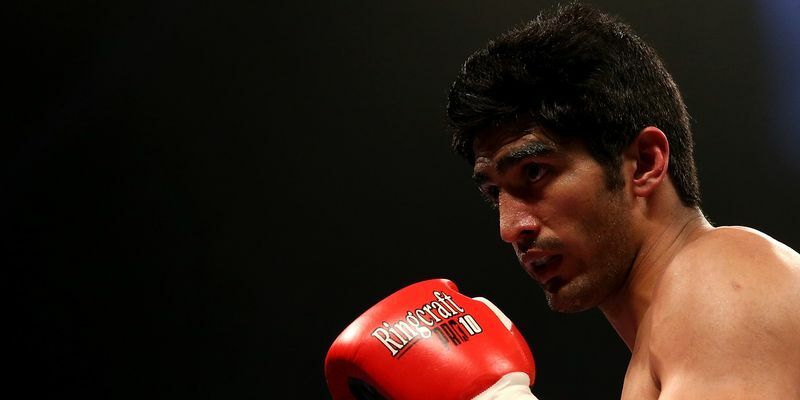 We have tentatively talked with Amir's team, I know they want it, I know Vijender wants it," said Vijender's British promoter Francis Warren of the Queensberry Promotions, reported PTI. "There are a lot of options for Vijender. After this fight, he will have a world ranking of top 15 in the WBO and it is a question whether he will keep climbing the ranking by fighting guys in the top 15 or keep hold of that belt, he has to defend that belt within 120 days or we go after Luke, who is the Commonwealth champion," Warren said. "I think that's a great story and a great fight and I am confident Vijender will win that fight. Luke was supposed to fight here, but he did not fancy coming here so maybe he will fancy it even less now after this great fight," he quipped.